Spirulina contains no cellulose in its cell walls, so it is easily absorbed and integrated into the body when digested. Proteins: Spriulina has a very high protein concentration (55-70%) for a plant. It contains the essential amino acids leucine, valine, and isoleucine. Because of its digestibility and amino acid balance, the usable portion of spirulina is around 90% (the highest of any protein other than casein)! Vitamins: The superfood is rich in vitamin A, D, K, B1 (Thiamine), B2 (Riboflavin), and B3 (Niacin). Vitamin A is important for proper vision, our immune system, and reproduction; while vitamin D helps the regulation of calcium and phosphorous absorption. Vitamin K plays an important role in blood clotting and building strong bones. The B vitamins help turn our food into useable energy. Minerals: Spirulina has a high composition of calcium, iron, magnesium, manganese, and chromium. These minerals are good for proper translation of nerve impulses, energy production, formation of healthy bones and teeth, and the production of red blood cells. Lipids: Spirulina is 4-5% lipids and contains the essential fatty acids that may help reduce inflammation that cause some disease and cancers. Spirulina is an excellent source of antioxidants, which can protect against oxidative damage. The active ingredient in spirulina is called phycocyanin. When in it's active state (C-phycocyanin) it can fight free radicals and inhibit production of inflammatory signally molecules (1). Free radicals are atoms with unpaired electrons that occur naturally in the body; but when food or environmental factors (tobacco, pollution, herbicides) lead to an excessive amount, the body cannot handle them properly and damage occurs in the form of oxidative stress (damage to our cells that can lead to disease). Spirulina has been shown to lower total cholesterol, LDL and triglycerides, while raising HDL (the "good") cholesterol. During a 3-month intervention study, the mean levels of triglycerides, LDL, total cholesterol, and the ratio of total cholesterol to high-density lipoprotein-cholesterol were significantly decreased (2). GLA is the main component responsible for these cholesterol lowering attributes. When taken daily at a dose of 4-5 grams, spirulina has been shown to reduce blood pressure in individuals with normal blood pressure levels (3). In one study (4), spirulina consumption significantly improved the allergy symptoms of nasal discharge, sneezing, nasal congestion and itching compared to the placebo. Some studies have shown that spirulina can enhance endurance due to its rich bioavailable iron source. So far, animal studies have shown that spirulina can lower blood sugar levels. In a recent study, diabetic rats were treated with spirulina and showed a decreased hyperglycemia and oxidative stress rate (8). It is likely that spirulina may be helpful in the prevention of diabetic complications in humans. Supplemental spirulina is available for purchase in tablet or powder form. I prefer to add the powder to my smoothies, chia pudding, or no-bake energy bites. Start your day off with an abundance of antioxidants by adding my Berry Superfood Breakfast Smoothie to your routine. Additionally, you could stir it into salad dressings, sauces, and dips. The source and quality of spirulina is very important. Make sure to purchase a non-GMO spirulina that comes from a clean, reputable source and isn't grown in a region affected by environmental pollution as it will absorb toxins. 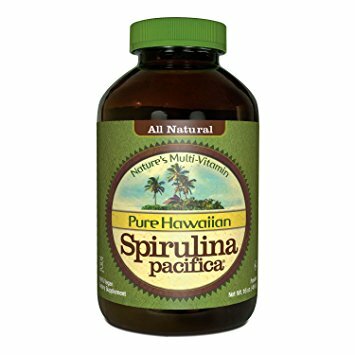 I recently purchased Pure Hawaiian Spirulina Powder (click hyperlink for direct access) and love it! Please keep in mind whenever you try a new food to start small and see how your body reacts to the food. I suggest starting with 1 teaspoon/day and slowly working your way up to 1 tablespoon/day or every other day. Although, the superfood is somewhat expensive, when compared to other supplements (that are mostly unnatural) this value is worth the cost (at least in my opinion)! The 16 oz bottle that I purchased has 151, 1 teaspoon servings which will last me about 3 months as I am healthy, eat a variety of leafy greens and other whole foods, and thus do not feel the need to consume spirulina daily. 1) PLoS One. 2014 Apr 1;9(4):e93056. doi: 10.1371/journal.pone.0093056. eCollection 2014. 2) J Sci Food Agric. 2014 Feb;94(3):432-7. doi: 10.1002/jsfa.6261. Epub 2013 Jul 10. The hypolipidaemic effects of Spirulina (Arthrospira platensis) supplementation in a Cretan population: a prospective study. 4) Eur Arch Otorhinolaryngol. 2008 Oct;265(10):1219-23. doi: 10.1007/s00405-008-0642-8. Epub 2008 Mar 15. 8) Nutr Res. 2016 Nov;36(11):1255-1268. doi: 10.1016/j.nutres.2016.09.011. Epub 2016 Oct 4.